Carbonated drink filling production and bottling line is mainly suitable for filling carbon drink which have gas (Carbon dioxide) . Carbonated drink filling production and bottling line is mainly suitable for bottling and packing of round or square polyester carbon drink bottles. According to the demands of different specifications of users, it is only changed a little in design to meet the user’s demands. Carbonated beverages (soda) is filled with carbon dioxide gas in the beverage. The main components of carbonated beverages include: Carbonated water, citric acid and other acidic substances, sugar, spices, and some contain caffeine, artificial colors and so on. Carbonated included : Coke , Sprite , soft drinks. RO system removes all hydronium, organic substance, colloid, bacteria of the raw water. So it can produce the most purified water. You can use reiver water , underground water and city water as resource water. The final pure water standard TDS is 2-10. For example, If one kind of water composed entirely of water molecules, its TDS is 0. Most market pure bottle water TDS is 2-50. 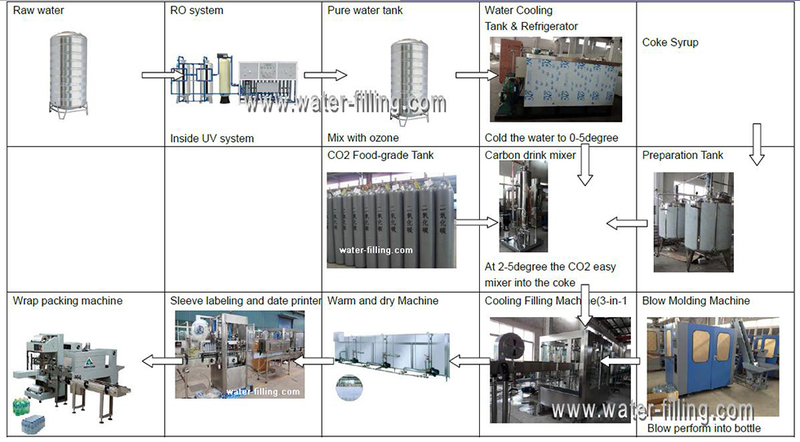 It supply pure water for mixer and produce CO2 drink, the carbon drink will have the best testing feeling. Carbonated drinks (soda) products is under certain conditions filled with carbon dioxide gas including drinks, carbonated drinks, sports drinks and other inflatable specific varieties, not including the production of carbon dioxide gas from its fermentation beverage. The content of carbon dioxide in the finished product (at 20 DEG C) is not less than 2 times. Carbonated drinks are the main ingredients for sugar, pigment, sweeteners, sour agents, spices and carbonated water, etc., generally do not contain vitamins, mineral. Carbonated drinks (soda) can be divided into fruit type, fruit type, cola type, low calorie, other type, such as: Sprite, Fanta, Coca Cola, 7up mirinda. The fruit juice carbonated beverage that contains more than 2.5% natural fruit juice and carbonated drinks; fruit refers to the spices as the main fragrance agent, fruit juice content of less than 2.5%; carbonated beverage that contains Cola fruit, lemon, white wine, caramel; other carbonated drinks: carbonated drinks, milk egg white ice cream soda. Carbon drink mixer is the most important equipment in the carbon drink bottling line. One kind of drink can not be Carbon drink without CO2. So, mixer CO2 with water and syrup is the key process. Carbon drink mixer can good mixer cooling water with syrup and CO2. And produce out carbonated drink. 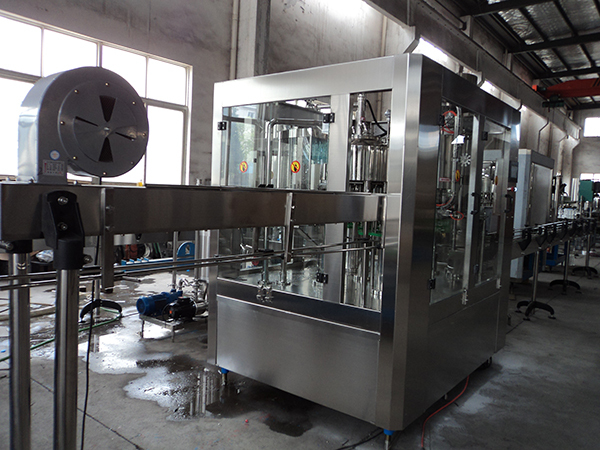 Carbon drink Washing-Filling-Capping machine is an ideal carbonated drink filling production equipment in the country. It is mainly suitable for filling and capping of round or square polyester bottles. According to the demands of different specifications of users, it is only changed a little in design to meet the user’s demands.